AgroAtlas - Crops - Brassica oleracea convar. botrytis (L). Alef. Var. botrytis L. - Cauliflower. Brassica oleracea convar. botrytis (L). Alef. Var. botrytis L. - Cauliflower. Family Brassicaceae Burnett, genus Brassica L.
Annual plant. Root system fibrillose, superficial. Stalk is smooth, cylindrical, about 15-70 cm tall. Leaves forming rosette are sessile or with leafstalk, 30-40 cm length, lyre- pinnate-shaped, lanceolate or ovate, green colour with lilac shade, sometimes with a strong waxen bloom. Inflorescence is short, with thickening, strongly ramified close-coiled branches and pedunculed fleshy buds, which form the dense head. The head of the different form and colouring (white, white-yellow), weight about 1,5-2 kg. Numerous peduncules sprouts are formed in the first year of life. Flowers 1,5-2 cm diameter, pale yellow or yellow colouring. Pods are 6-8 cm length with thin short beaks. Seeds fine - 300-400 thousand seeds in 1 kg. Early ripening grades have the period from shoots up to technical ripeness of the heads 80-110 days, middle-early ripening grades - 110-125 days, middle-late ripening grades - 145-220 days. Grades: Moskovskaja konservnaja, MoVIR-74, Moskvichka, Otechestvennaja, Skorospelka, Snezhinka, Kruglaja golovka, Garantija, Rannjaja gribovskaja 1355. The origin of species is related with Mediterranean genetical center. In Russia it has appeared, presumably, in the middle of 19 century from Holland. The area under crops of cauliflower occupied about 3.6 thousand hectares in the USSR. It is cultivated almost in all soil - climatic zones: from Leningrad region up to Kamchatka; from Yamal up to Azerbaijan. Average productivity 15-20 ton per hectare. It is frigostable species, some sorts are cold-resistant (up to minus 3-4° C). Optimum temperature for heads formation 15-18 degrees Celsius. It is photophilous. Optimum length of light day is 17 hours (in southern areas - 14 hours). Long light day has a bad effect on heads formation. Requires constant high moisture of soil and high relative humidity of air. Pretentiously to fertility. Prefers easy loamy soil. Vegetable plant. 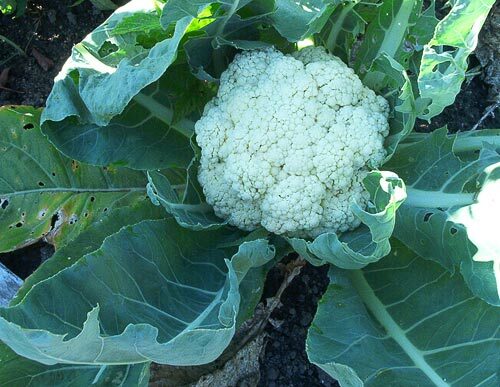 The cauliflower is appreciated for nutritious, tasting and dietary properties. It contains much nitrogen-free and nitrogenous substances, 1,7-4,2 % of soluble sugars, 1,1-1,3 % cellulose, mineral substances, vitamins A, B1, B2, C, PP, K. Used as a fresh vegetable in salads, as for preparation of soups, second course, preserve.